Caught in the complex social, political, and economic fabric that often shapes environmental decision making, I was surprised and, frankly, refreshed to find that designing environmentally equitable cities seemed rather obvious to a teenager. This interview took place amid my research last summer, where I explored how “design thinking” can enable at-risk teenagers to understand and propose solutions to urban water depletion in Los Angeles, California. Design thinking is a creative teaching and learning approach that involves observation, problem framing, and hands-on prototyping. When compared to more direct methods of classroom instruction, design thinking has been shown to boost students’ comprehension of complicated problems. 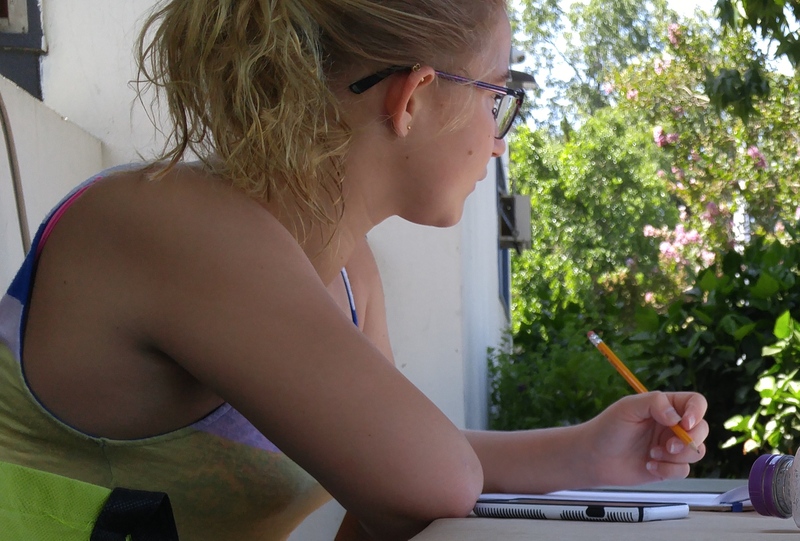 Overwhelmed by standardized testing, at-risk students are falling through the cracks of an inflexible educational system that prioritizes uniform approaches to teaching and learning over student interest and creativity. 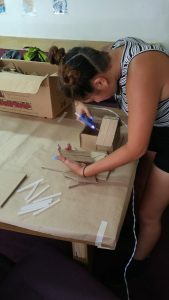 Despite this, few studies have examined the potential of a design thinking approach to help at-risk teenagers analyze the environmental challenges disproportionately impacting their lives and neighborhoods, such as urban water depletion. 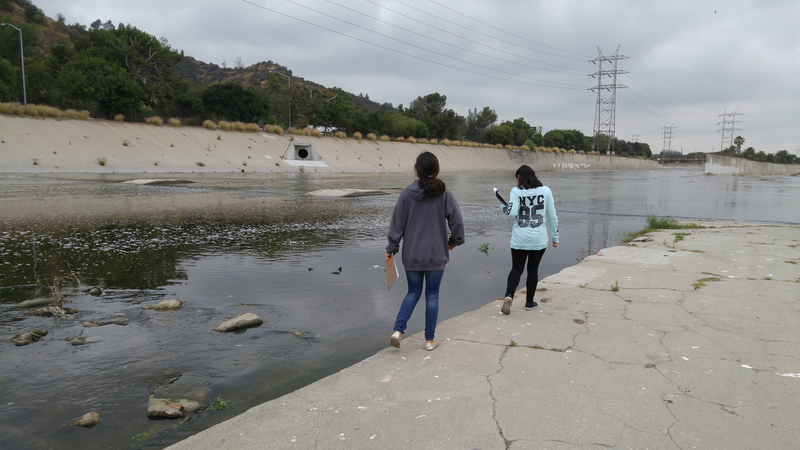 Using Los Angeles’s drought as a case study, I sought to understand what at-risk teenagers know about the city’s water supply and basic hydrology, their values concerning urban water usage, and the thought processes driving their design decisions. Ultimately, I wanted to understand their attitudes toward design thinking as a teaching methodology and learning approach. 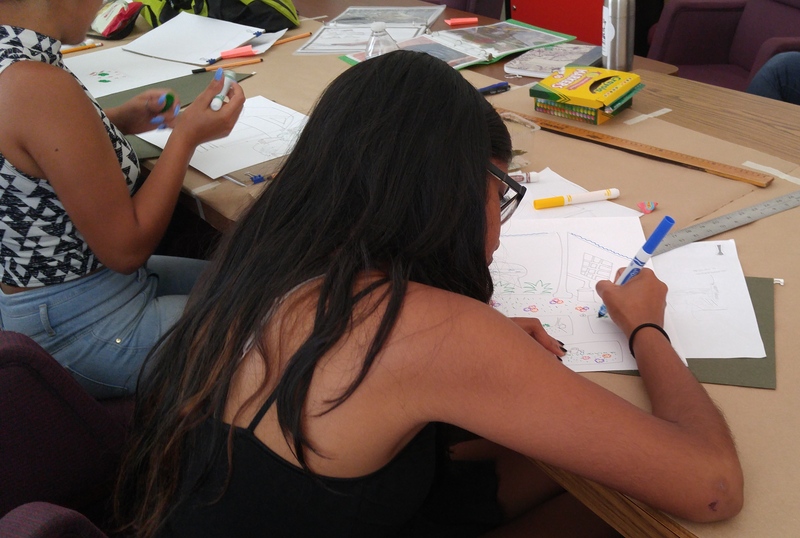 I ran the first design thinking workshop in a narrow “Teen Terrace” enclosed by concrete walls, under a sign that read “Great Futures Start Here.” Throughout the summer, I continued facilitating subsequent workshops at various youth organizations in Los Angeles County. Altogether, groups of teenagers affiliated with The Boys and Girls Club of Burbank and Greater East Valley, Hands4Hope Los Angeles, and North Valley Caring Services signed up to participate in the three-day program. Teens who decided to participate were already concerned about the effects of the city’s drought, motivated to make a difference in their community, and valued individuality and self-reliance. The design thinking workshop was composed of four steps: 1. Observation; 2. Brainstorming; 3. Ideation; and 4. Prototyping. Observation activities took place along the Glendale Narrows, the only unpaved, soft-bottom stretch of the Los Angeles River with visible riparian vegetation. Participants noted and compared green and grey infrastructure surrounding the river. While the LA River crossed most participants’ daily commutes, many were surprised to see pools of water in an otherwise paved, arid landscape. Comparing paved and soil surfaces along the river channel helped illuminate the importance of water retention and infiltration, as well as habitat restoration. The teens recognized that the river was part of a larger ecosystem requiring diverse habitats for species to thrive. They began to question why certain areas supported vegetation and wildlife while others did not, and recognized how human-made features like culverts directed water flow. The teens also investigated new water features, such as bioswales, which they did not expect to find in a nearby public park. Surrounded by mountains, they questioned why so much water was imported without optimizing the capabilities of their own watershed. They wanted to see things done differently. Brainstorming activities involved noting areas of heavy water consumption on post-it notes and clustering words and phrases thematically. These activities involved collectively writing and sketching ideas on poster-size paper and helped build literacy. Once introduced to new concepts like virtual water, the teens used related terms, such as blue, green and grey water comfortably. 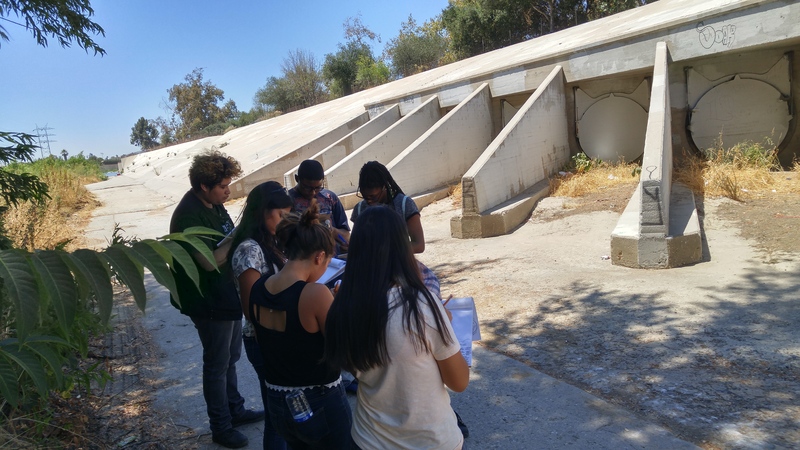 Some teens remembered the names of water features they saw on the field trip, such as bioswale and culvert, while others remembered words and phrases they thought were cool like cistern. The brainstorming process enabled participants to share, discuss, and ultimately apply the new terms and concepts they learned to their design projects. Participants sketched a variety of ideas to address the design challenge and selected one to refine. Building on the lessons learned from observation and brainstorming activities, the teens were given a design challenge: to develop an idea that reduces heavy water usage and replenishes groundwater at their own youth organization facility. 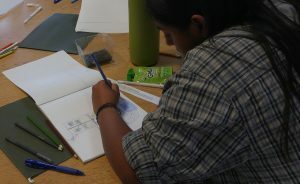 Returning from the river, the teens were excited to reimagine their workshop site. Walking around each site as a group, I pointed out landscape features that could direct water. However, I was excited to see how eagerly the teens chimed in with more ideas. After visiting the river and jotting down their initial thoughts, nearly every group noticed inefficiencies like downspouts that led water to asphalt instead of vegetation at their youth organization facility. The teens recognized the benefit of having many ideas to choose from. They grew attached to their final idea, and with this sense of ownership, were committed to completing their projects. Participants created a final poster and small-scale, cardboard “prototype” of their selected idea. 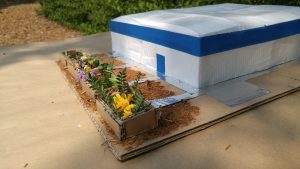 Building in 3D helped the teens envision how their idea would “work if it was put into real life.” They considered how the features of their design would interact with the existing landscape, how topography would direct water, and where water would be stored for later use or infiltration. The teens were surprised by their own aptitude for creativity; their ideas were inspired, carefully planned and executed. The teens designed practical solutions that could easily be implemented at their youth organization facility. One teen split and redirected a downspout to multiple areas for infiltration. Another addressed a very real challenge at her site by positioning a garden directly below a dripping AC unit. 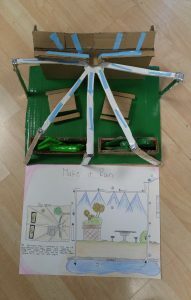 A few teens even considered onsite wastewater reuse and included smart sprinkler systems in their designs. Others redesigned the entire site and imagined a series of pipes carrying water to vegetation, underground cisterns, aquifers and the LA River. They slanted and rounded roofs and fields to maximize water collection. 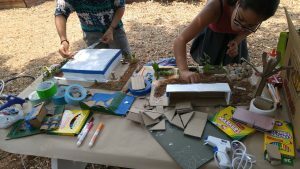 Some teens went as far as making topographic changes and designed hills, culverts, and bioswales to direct water. One teen added an educational component to her design by including signage that explains the benefits of green infrastructure to the younger kids who also use the site. 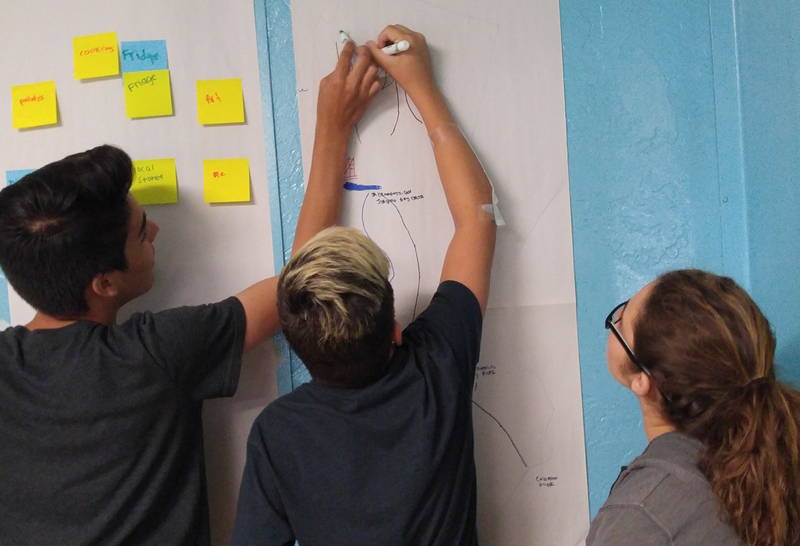 Seeing at-risk teens motivated and enthusiastic about solving difficult, real-world problems emphasized the significance of design thinking––an approach that rewards overlooked strengths, develops underutilized capabilities, and recognizes the potential these students possess. Most importantly, though, design thinking can help support at-risk teenagers in recognizing the tremendous value of their own ideas. Creating accessible pathways to engage at-risk teenagers in solving environmental challenges is vital to the success of current and future environmental movements, which are in need of diverse voices. Given the environmental hurdles facing urban and rural areas, the untapped passion and genuine concern these students have for making a difference must be embraced should success and progress effectively take root. A vast landscape of polluted grey streets amplified the midsummer heat wave. 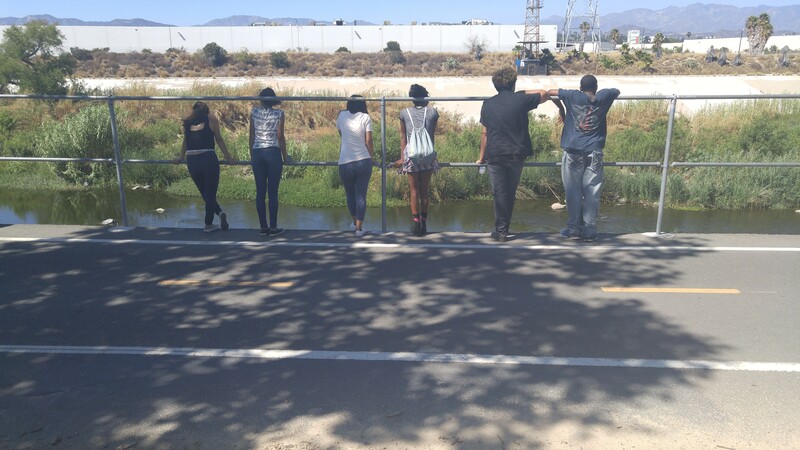 Yet, amid a small stretch of lush vegetation lining the LA River, the teens found the inspiration they needed to imagine a different Los Angeles. Yanin Kramsky is a designer and Master’s student at Yale F&ES. 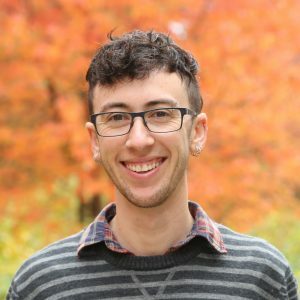 They are passionate about research methods that prioritize community involvement and agency, and creating avenues for youth to critically examine environmental challenges.